Bún riêu cua (riêu, pronounced with a ‘z’ sound, like boon zeew) is a Northern style soup, popular in Hanoi as a breakfast. As always I break down the translation of the words for myself because I find that the more individual words I recognise in a language, the easier I find it to work out what and how a country eats – Bún (noodle, in this instance a white rice noodle) riêu (soup) cua (crab). Noodle soup, with crab. The strong flavoured, and delicious soup is made using tomatoes and stock generated from the crab shells and additional pork bones. The noodles are joined in the broth with soft, pillows of tofu which soak up all the delicious juices like a sponge, rogue lumps of soft poached tomatoes and clustered crab meat. The crab meat is cooked with a mixture of spices and eggs (as a binding agent) and added to the broth. It can break down in the bowl, physically resembling scrambled egg, but having a much more crab-like taste. The dish is served with the usual sides of mixed Vietnamese herb leaves, pungent shrimp paste and beansprouts.As a popular breakfast, many places will stop serving before lunchtime. We enjoyed eating at 11 Hàng Bạc, a tiny unmarked restaurant where customers gather in a busy, crowded front room, which also spills out onto the street – grab a seat outside if one is available. Like many noodle soup dishes in Hanoi & Vietnam fried breadsticks, known as quay, (may also be known as youtiao or Chinese crullers) can be added to soak up the juices. A bowl cost around 25’000VND. Thanks for visiting! You can join us on Facebook, for more pictures, and other bits and pieces. You can also follow us via email & if you liked our posts please share them using the little social media buttons below. The French occupation of Vietnam or French Indochina as their cartographers would refer to it, left plenty of cultural clues – Crusty baguettes and pâté made famous as a sort of backpacker rite of passage meal, Bánh mì. Then there’s caramen, a near identical replica of the delicious wobbly French treat, crème caramel. In caramen nếp cẩm lies the Asian variation, a plastic cup with crème caramel is topped with fermented black sticky rice, my translate app gave me the wonderful translation for nếp cẩm as “this special rice”, as usual miles off base when you want to know simple ingredients but I’d like to think it’s how it’s referred to, because the rice is delicious, with a bit of chewiness and slightly fruity from the fermentation. When it arrives it’s got lovely layers of Caramel, fermented rice and ice, with another ingredient (which I presumed was coconut milk , but I’m not so sure anymore) and you can mush it all up, or eat it surgically (my preference) it’s a great treat, and a good cure for the vicious Hanoi summer heat and humidity. We visited Kem Caramen, 29 Hàng Than. Expect to pay around 15’000VND per cup of ‘special rice’. Little English is spoken, but they have a handy board with the menu in Vietnamese, pointing got the job done. As always when I travel I try to break down the translation of the words for myself because I find that the more individual words I recognise in a language, the easier I find it to work out what and how a country eats – Bún (noodle, in this instance a white rice noodle) thit (meat) nướng (grilled) ‘grilled meat on noodles’. Bún thịt nướng comes from the south of the country and it’s the perfect blend of sweet, sour and spicy whilst being incredibly fresh and, like many other Vietnamese dishes pretty healthy. There’s quite a lot of components – Fresh bún rice noodles are served cold, topped with grilled pork meat which is marinated in a mixture of sugar and fish sauce. The grilled meat has great smoky, fatty caramelised flavours. Chilli, peanuts, beansprouts, pickled carrot and cucumber matchsticks and crispy fried onions are added to add texture and balance the ingredients. For freshness, a handful of Vietnamese herbs, mint, perilla and lettuce are added with fresh coriander. The contents are dressed with Nước chấm (pronounced more like nook chum) – a dipping sauce, which blends sweet and salty flavours of fish sauce, palm sugar, lime and sometimes chilli and/or garlic depending on its use. Often, many places will include fried minced pork spring rolls known as chả giò (pronounciation more like jah zo) – the warm slightly greasy crunch is a welcome addition. In Hanoi, a lot of the food you encounter is noodle orientated and seemingly tourists go crazy for phở and Bún noodles – which are both great, by the way – but what about other noodles? Mien or bánh đa? Although bánh đa is, like the aforementioned a rice noodle it’s brown, with a chewier texture. It’s a really nice variation when you’re a little noodled out with the more popular soft, white rice noodles. The dish itself eaten is mien bánh đa cua. Mien refers to thin noodles, usually known to westerners as glass noodles, or vermicelli. Bánh đa is the thick, flat brown rice noodle with visual similarities to tagliatelle. Cua as in crab refers to the broth. Traditionally, the meal is from Hải Phòng, on the coast near to the well-known attraction of Hạ Long Bay – it is something you can find in the bigger cities. The mixture of noodles are served with sausage shaped chả lụa (seasoned pork ground to a paste before being wrapped in banana leaves and steamed until a sausage-like loaf is made) some crumbed crabmeat, flakes of soft meat, greens (it may be morning glory, or a type of water spinach – I’m not sure) beansprouts soft pillows of tofu, boiled egg and a fried fish cake overflowing with fresh dill flavours. Table options included crushed peanuts and chilli sauce to personalise the flavours. Overall, it’s one of the best noodle soups available in Hanoi – an overflowing bowl of delicious ingredients, contrasting texture and flavours. We ate at Mien Bánh Da Cua , 59A Phùng Hưng, on the eastern side of the Old Quarter. A bowl cost 30’000VND, little English spoken but the lady chef was eager to feed us on every visit. For me, treasured travel memories often revolve around great food, tastes that make you go ‘mmm’ and make utterances towards deities. Cá cuốn, also known as cá cuốn thịt is an ‘oh my god’ moment. Ca cuon thit – croquettes of joy. The name translates as cá (fish) cuốn (cake) and thịt (meat) – A understated name for a barrel shaped, croquette like deep fried nugget of deliciousness. It’s impossible to only order one. It’s quite precise, when you break it down – filleted fish is wrapped around a paste of ground pork and woodear mushrooms, a similar mixture to that which is used for filling bánh cuốn. It’s sealed, crumbed and deep fried. It works as an excellent accompaniment to the equally delicious soup, Bún cá – Available from the same street kitchen. Expect to pay around 10’000VND per piece. The name, Bún cá, translates literally as noodle (bun) and fish (ca) leading to a potentially wide interpretation and delivery of a simple noodle soup. 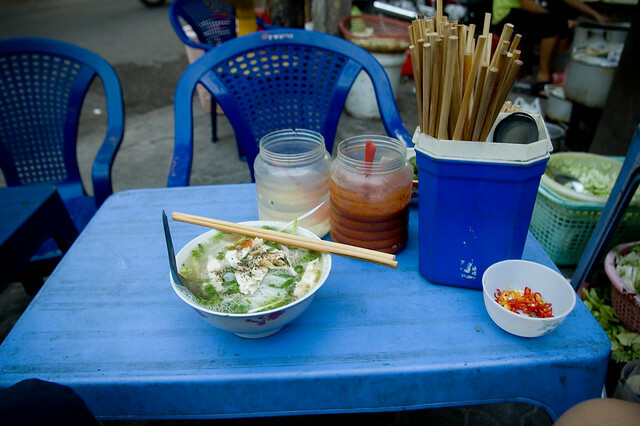 In Hanoi, this represents a thin tomato based stock, packed full of dill and slithers of spring onions, bún – a thin rice noodle, comparable to vermicelli – and wilted greens topped with golden, crispy chunks of deep fried river fish, not to be confused with the synonymous Hanoi dish bún chá. There’s a certain amount of alchemy going on here, because at face value, it’s just noodles, tomatoey broth and fried fish. The broth! The broth is a delicious nectar – sweet from the tomato, soured with the use of pineapple, purists and haters of fruit in soup this may be the conversion you need. If you’re lucky, you might just get a chunk bobbing around in the bowl. The fish retains the crunch, it’s still just as pronounced and satisfying five minutes in, when you’re fishing bits out of the bottom and they somehow haven’t been corrupted and softened by the juices. The taste and crunch has that familiar comforting deep fried texture. The oily residue coagulating on the surface would normally be considered a downside, but somehow it adds to the flavour, the huge amounts of dill scattered in the bowl cuts through the grease like a knife. This is absolutely one of my favourite Hanoi meals. I was drawn here by the cá cuốn thịt, a deep fried roll of minced pork, mushrooms and fish – equal parts unhealthy and indulgent. It’s impossible to only order one. Dill as a herb in Vietnamese cuisine is a popular ingredient used with fish in Hanoi and the north. The further south you go the less you will see it used, it’s also a common ingredient in the classic, sought after Hanoi dish Chả Cá Thăng Long, a skillet of sizzling fish seasoned with turmeric and served with fresh dill. It’s available on Pho Cha Ca – fish street. Expect to pay around 35’000VND for a bowl. Phở ga (chicken) is a variation of one of Vietnam’s famous and most exported dishes phở bo – Beef noodle soup. There are distinctions between the dishes and it’s not as simple as just a substitution of proteins. To begin with, the chicken phở broth is much lighter than the beef broth. The end result tends to have less colour depth, too. phở with beef, utilises strong aromatic flavours such as star anise and and cloves to make the broth so flavourful, whereas the chicken version focuses on ginger, coriander (seed and leaf) and fish sauce to intensify the chicken broth. It makes sense, the flavours better coexist together. Fixings are similar, for both dishes the meat is served with banh phở – the specific type of noodles for phở, – they are different from mien noodles, or bún noodles which are used in other Vietnamese dishes – with some thinly sliced onion and lime segments. Chicken phở is finished with thinly sliced lime leaf and coriander leaves. It has a much softer taste than it’s beefy compatriot and with a squeeze of fresh lime and a dollop of chilli sauce is just as good a flavour hit as the beef. My only fault is that the chicken will, invariably contain bones and lumps of cartilage but the silver lining to that same dark cloud is that the chicken phở has skin and gelatinous chicken meat. – Delicious texture & flavour! It can, like many Vietnamese soups be accompanied by quay – the Chinese deep fried doughnuts also known as youtiao or crullers. Expect to pay around 30-50’000VND per bowl.